In late April, Google launched AdSense category filtering for some limited publishers. In short, it let publishers block ads by ad category, i.e. block all ringtone ads. Google has announced that they have expanded the beta and added some features. The beta is now available in "English-speaking countries including, but not limited to, Australia, Canada, India, Ireland, the U.K., and the U.S." I personally see it myself. 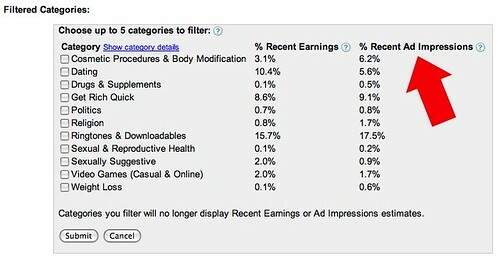 In addition, Google added ad impression data to the impact report. Plus Google is using more accurate percentages by using the past 30 days of data (not past three days). Plus Google has enabled a way to see category descriptions by clicking on the link that reads "show category details."